Guess where that one’s headed. Moving the Needle: Jhonny Peralta homers to put the Tigers back on top, +.467 WPA. Do you like high scoring games? Do you like multiple lead changes? Then you probably should have been watching the Tigers and Twins square off yesterday afternoon. Only one inning passed without either team scoring a run, the sixth, and even then both teams loaded the bases. In the eighth, with the Twins on top 6-5, the Tigers seemingly struck the definitive blow when Jhonny Peralta hit a long two-run homer to left. It flew farther than the two-run shot that topped the charts in Tuesday’s game. The Twins caught a break in the bottom of the inning when they scored on an error, but the Tigers again struck in the ninth, this time holding the lead and taking the game. Jason Kubel: 2 for 3, 1 HR, 2 BB. That’s only his fourth home run of the year, yet his wOBA has crossed the .400 mark. Victor Martinez: 3 for 4, 1 HR, 1 BB. He has three hits in each of his last three games, including four doubles, two home runs, and three walks. That’s one way to compensate for missed time. Brandon Inge: 2 for 5, 1 3B. His ninth-inning triple put the Tigers on top for good. 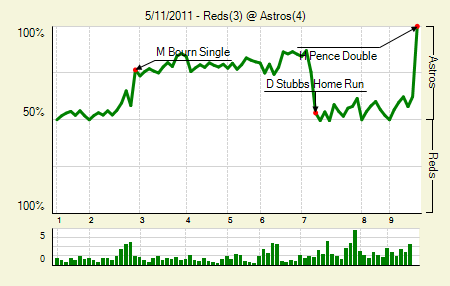 Moving the Needle: Hunter Pence walks off with a double, +.377 WPA. There was only one out, but J.R. Towles knew he could take off from first the instant Hunter Pence drilled the Mike Leake offering. It was an absolute liner down the right field line, and no fielder was going to come close. It seemed to catch the Reds so off-guard that there wasn’t even a relay throw. Towles sprinted across the plate, and the Astros celebrated victory in a game they nearly squandered. For Pence, it was his second double of the game. Drew Stubbs: 2 for 5, 1 HR. His homer in the seventh tied the game at three. Michael Bourn: 2 for 5, 1 2B. He drove in half of the Astros runs. Boy, his stat line looks an awful lot like the one he produced last season. 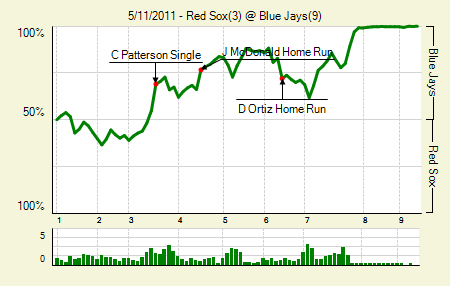 Moving the Needle: Prince Fielder’s two run shot ties the game, +.256 WPA. At first I couldn’t decide which was more bizarre, this game or the Twins-Tigers one. 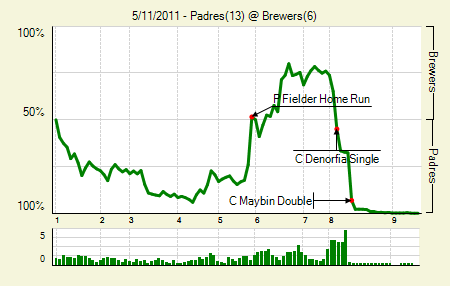 But, since this one involved the Padres racking up 13 runs on 23 hits, I have to go with this game. It was Fielder, though, who moved that WPA line the furthest with a huge — both in length and importance — homer in the fifth, tying the game at five. The Brewers actually took the lead in the next inning, but in the eighth the Padres rallied for eight runs. Chris Denorfia: 3 for 4, 1 HR, 2 BB. He hit his third homer of the year on the second pitch of the game. It does appear he’s found a niche as a part-time player in San Diego. Cameron Maybin: 4 for 6, 1 2B. The three-run double broke open the game in the eighth. He raises his average from .233 to .252 in this game, which should say something about the nature of rate stats at this point in the season. Ryan Ludwick: 3 for 6, 1 HR. 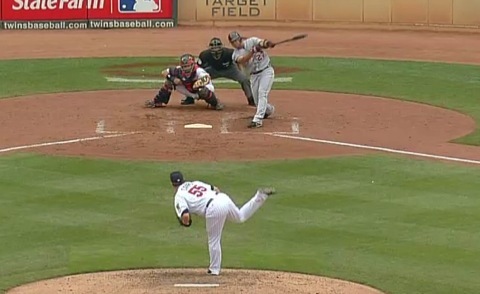 If Maybin broke the game open, Ludwick stepped on it and squished the remaining life out of it with his follow-up homer. Moving the Needle: Corey Patterson ties the score at one, +.142 WPA. That’s a pretty bland top play for a 9-3 contest. Patterson’s third-inning single tied the game at one. It did put runners at the corners with none out, which the Blue Jays did take advantage of, taking the lead on a ground out later in the inning. It wasn’t until the later innings that they really laid into John Lackey. John McDonald: 2 for 4, 1 2B, 1 HR. I don’t know how I didn’t notice this (or noticed it and forgot it), but McDonald had a .204 ISO in 163 PA last year. Those were his fourth and fifth extra base hits of 2011. Rajai Davis: 4 for 4. Yeah, they were all singles, but singles can do it for a guy like Davis. He swiped two bags in the game and scored two runs. Unfortunately, this was not a real game, since Jose Bautista didn’t get the extra base hit part of his checklist. Only half complete, Jose? You’re slipping. Moving the Needle: Sam Fuld doubles home the first run, +.125 WPA. After a mythical opening to the season, Fuld went into a deep slump. From April 24 through Tuesday he went just 4 for 60. But last night he led the Rays offense, going 3 for 4 with a double and a walk. Two of those his represented the game’s biggest WPA swings. In the second he doubled to right, bringing home Reid Brignac to make it 1-0 Rays. 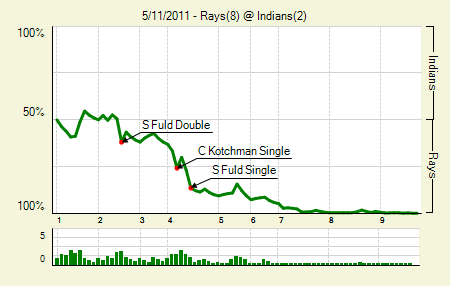 Then in the fourth, when the Rays plated three runs, Fuld drove in another with a single. They tacked on some runs later and went on to win the game with ease. Matt Joyce: 2 for 5, 1 HR. Remember when Joyce was 1 for 20 to start the season? Me neither. His WAR batting component is already more than a run better than all of last year, in fewer than half the PA.
Ben Zobrist: 1 for 2, 1 HR, 2 BB. He already has eight homers this season, after 10 last season. 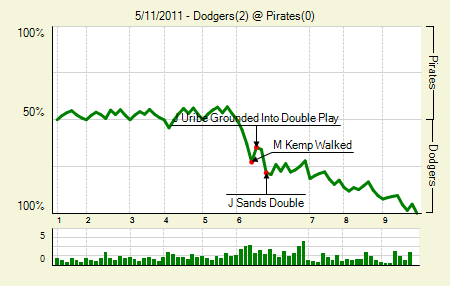 Moving the Needle: Jimmy Rollins breaks the tie in the ninth with a two-run single, +.412 WPA. He almost hit it too hard. The Phillies, after trailing 3-0, came back in the last third of the game, capping their rally in the ninth. With runners on second and third Rollins lined one into right, easily scoring the lead runner, but the trail runner had to slide around the tag in order to make it home. 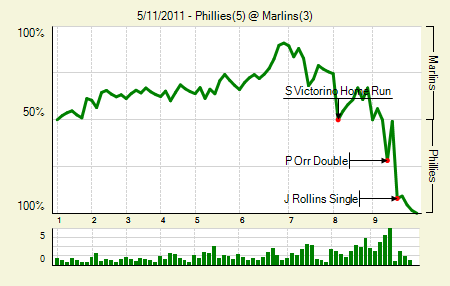 Not that the run was necessary; the Phillies had already taken the lead. But insurance is always welcome. Pete Orr: 2 for 2, 2 2B. The man will not make this list often, so let him shine when he had a really good day at the office. Hanley Ramirez: 2 for 4, 1 HR. I hadn’t even realized how badly things were going for Ramirez. Even with the homer, his second of the year, he’s at a .281 wOBA. Moving the Needle: Adam Jones extends the Orioles’ lead with a triple, +.172 WPA. This game revolved around the fifth inning, which started tied and ended with a 4-1 Orioles lead. 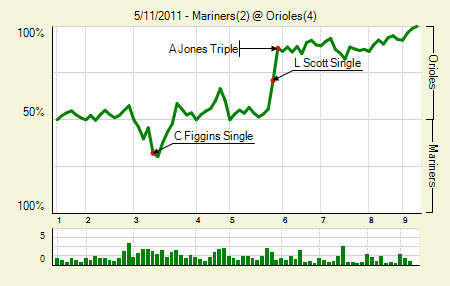 The Mariners recorded two outs to start the inning, but a single, hit by pitch, and another single put the Orioles up. Jones followed that with a double into the right-center field alley, scoring both base runners. Jones was 4 for 4 on the day. Chris Tillman: 6 IP, 3 H, 1 R, 1 ER, 3 BB, 5 K. That’s his best start of the season since his first. He also walked three in that game, coincidentally. Ichiro Suzuki and Chone Figgins: 4 for 9 combined. That’s a quality performance for the 1-2 hitters. Unfortunately, the 3-4 hitters, Justin Smoak and Miguel Olivo, went 0 for 7. Moving the Needle: Alex Cora brings the Nats back from two down in the ninth, +.445 WPA. The Braves led 3-1 in the ninth, handing the ball to Craig Kimbrel. Usually that works out. Last night it did not. Two singles and a walk loaded the bases, and Cora dribbled one back up the middle- hard enough to scoot past the infielders, soft enough that it allowed two runners to score. 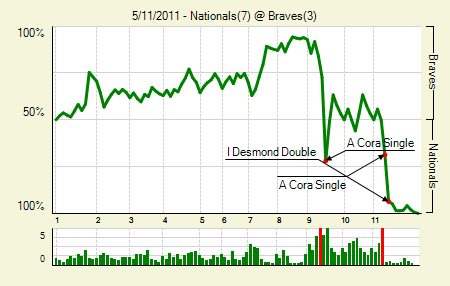 The hit prolonged the game, and the Nats took advantage of the new life. In the 11th they piled on four runs to put this one in the books. Jayson Werth: 2 for 5, 1 HR, 1 BB. The Nats had already taken the lead when Werth homered in the 11th, but with the way the last two games have gone I’m sure it made the Nats feel better. Brian McCann: 2 for 5, 2 2B. It’s been a slow start, but McCann has now recorded a hit in his last 11 games. He’s still waiting on the power, though. The two doubles were his fourth and fifth of the season, and he’s stuck on two homers. Moving the Needle: Curtis Granderson ties the game in the 10th, +.393 WPA. The following never makes sense to me. The Yankees had given up a run in the top of the 10th, and so had just three outs remaining with which to score a run and tie the game. Russell Martin walked to lead off the Yankees’ half of the 10th, and the Yankees bunted him over. Why would you give away an out — essentially taking time off the death clock — merely for the chance at scoring the run with a single? After a groundout advanced Martin to third, Granderson came through with a single to plate him. That’s all the Yanks would get, though. 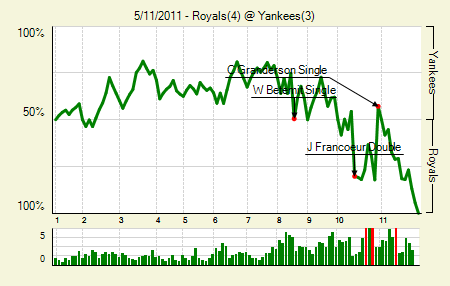 The Royals scored another run in the 11th, taking the second game of the series. Granderson had homered earlier in the game, his AL-leading 12th of the season. Eric Hosmer: 1 for 4, 1 HR, 1 BB. His sac fly in the 11th put the Royals on top for good. That was also his first big league home run. Thankfully for him, the fan who caught it threw it back onto the field. Moving the Needle: Jerry Sands extends the Dodgers lead with a double, +.125 WPA. It was the kind of hit that, with two outs, should have scored both base runners. With men on first and third with two out, Sands doubled into the right field corner. Unfortunately for them, the runner on first was Rod Barajas, who, even when running on contact, couldn’t come around to score. Not that it mattered in the final results. The Dodgers held down the Pirates all game, sending them back below the .500 mark. Hiroki Kuroda: 7 IP, 3 H, 0 R, 3 BB, 8 K. That’s a nice bounce back after a rough outing last time. His eight strikeouts is a high water mark for the season. Moving the Needle: Adam Dunn sets up the White Sox in extras with a double, +.220 WPA. Sometimes the setup is as important as the scoring play itself. Tied at four in the top of the 10th, the White Sox got a one-out single from Alexei Ramirez. Dunn then doubled him to third, which meant they could take the lead without requiring a hit. Kevin Jepsen provided the fuel there, uncorking a wild pitch on an intentional walk. What a way to lose the lead. That not only brought around the go-ahead run, but put Dunn at third. He scored on a sac fly for some insurance. Dunn himself was 4 for 5 with that double, a homer, and a walk in the game. 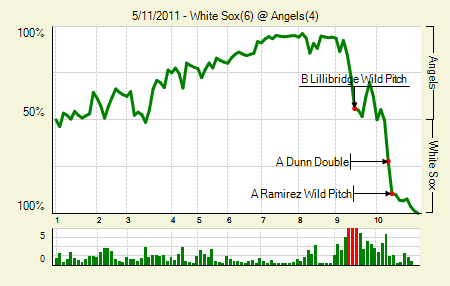 This was all possible, of course, because the White Sox battled back from down 4-2 against Jordan Walden in the ninth. A.J. Pierzynski: 4 for 6, 1 2B. I don’t want to write his name, and I’m sure many of you don’t want to read it. But the dude did have a solid game, including a big single in the ninth. Torii Hunter: 2 for 5, 1 3B. He’s slowly picking himself up after a poor start. 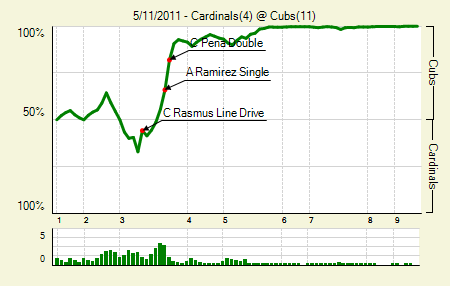 Moving the Needle: Carlos Pena gives the Cubs a lead with a bases loaded double, +.160 WPA. This game turned in the third inning when the Cubs loaded the bases with one out and then proceeded to assault the Cardinals pitching. Aramis Ramirez started it with a run-scoring single, and Pena followed up with a two-run double to make it 3-1. Two more singles put the Cubs up 6-1. They’d add another four in the fifth to put an even tighter seal on the game. Starlin Castro: 3 for 4, 1 3B. Mike Quade dropped him in the order on Tuesday. In the two games since then he’s 6 for 8 with a walk and a triple. Kosuke Fukudome: 2 for 4, 1 2B. That was only his fourth extra base hit of the year. They’ve all been doubles. His OBP is not only higher than his SLG, it’s 61 points higher. Moving the Needle: Xavier Nady leads off the ninth with a double, +.201 WPA. 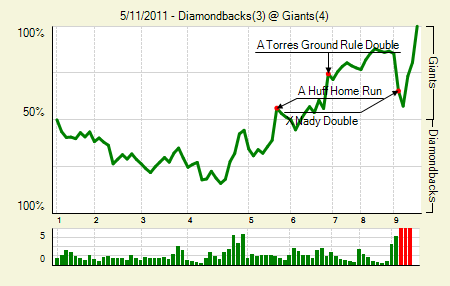 Apparently the Diamondbacks had a pretty good chance to come back in this one. Down 4-3 since the sixth, they got something going when Nady doubled to start the ninth. Even with two outs they had runners on second and third, so a single would have put them ahead. 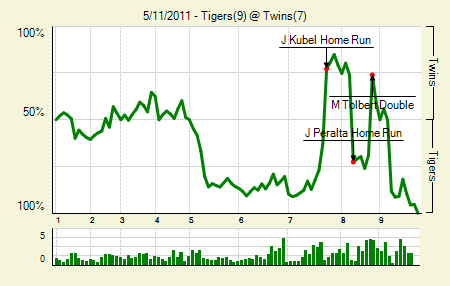 But Kelly Johnson flied out, which provided the second-biggest WPA swing of the game at -.193. Andres Torres: 2 for 3, 1 2B, 1 BB. His double in the eighth broke a 3-3 tie. Miguel Tejada: 3 for 4, 1 2B. And with that he no longer has the worst wOBA in the league. It’s up to .230, and so he has three players trailing him now. We hoped you liked reading The Morning After: Game Recaps for May 11th by Joe Pawlikowski! Is Howie Kendrick for Real? Bryce Harper – Best Prospect Ever? Thoughts on Peavy’s first major league start after surgery? Juan Pierre’s defense is appalling, and Peavy pitched well considering the layoff (0 BB). The punch and judy Angels nickel and dime the best of them, and shoddy defense doesn’t help. Peavy looked good, not great. He touched 93 with the fastball numerous times, his slider had good bite but he wasn’t locating it well at all. I was afraid his stuff wouldn’t be up to par, but it was. His command on the breaking stuff needs to improve, but I think there’s a good chance that it will when he gets another couple starts under his belt. Torii Hunter’s triple was really an error off of Juan Pierre’s glove. Tough play, but he should have caught it.